Finally getting around to posting about opening day (or so) at Super HK Food Court, 37-11 Main St, Flushing, in the basement of Super HK Supermarket, part of the Good Fortune Supermarket chain. So now the Big Three are the Big Four (at least until such time as things change again) and I’m eagerly anticipating eating my way through each stall in this brightly lit foodie fun house. My dining buddy and I hit Shaanxi Tasty Food, Stall 27, and got a pair of dishes which I referred to alternately as The Agony and the Ecstasy and the Zenith and the Nadir. Starting with Oil Spill Noodle (B1), aka Oil Splashed Noodle: Incredible! 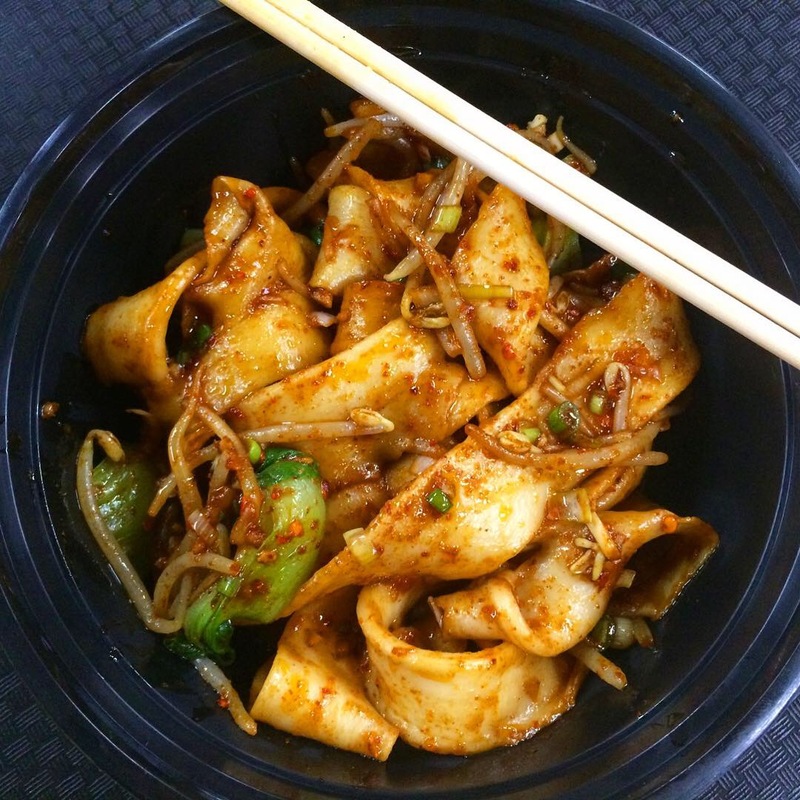 If you crave ultra long, extra thick, super chewy, hand pulled noodles, this dish is for you (and me); a spicy, gingery sauce graced the noodz with a few gratuitous veggies like baby bok choy and beansprouts tossed in. Even though there’s so much to explore in the new digs, I’ll snag another one of these next time I go – it was that good. 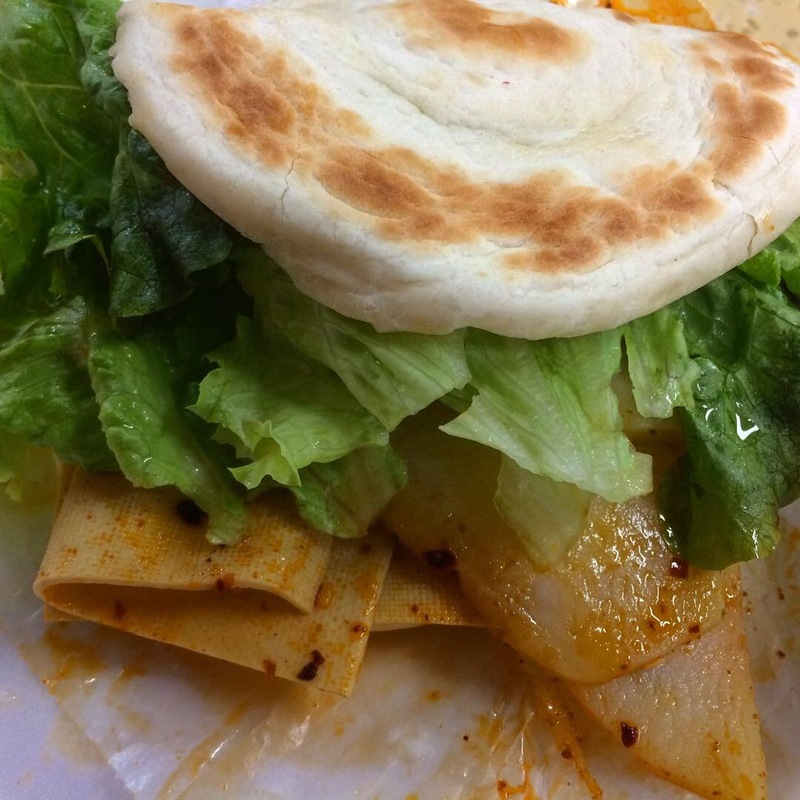 And then there was the Spicy Potato Chip Burger (A4) that featured a few potato slices boiled al dente (as they should be), lettuce, a tiny bit of bean curd skin, lettuce, a presumably freshly made bun, and lots and lots of lettuce. Did I mention lettuce? It just didn’t hang together, either physically or culinarily; I don’t know what they were thinking. So go for the Alpha, skip the Omega, and stay tuned for the next report.